I'm thrilled to announce that I'll be representing the Puccini Foundation at the 2015 BlogPaws Pet Blogging and Social Media Conference in Nashville starting tomorrow! And I'll continue our relationship by helping guide their social media efforts. Speaking for Bocci and Bella (as I often do), we couldn't be more proud to be affiliated with this not-for-profit foundation dedicated to "The hope of a future for for pets and people...cancer free." When you read Puccini's story, you'll understand the passion that drives this foundation, and why the years of work dedicated to raising awareness of pet cancers, supporting and funding cancer research and helping pet parents who can't afford cancer treatment for their pets, is just the beginning. Puccini's story is really one of inspiration and hope—hope for a cancer free future for all of us. We challenge each of you to join the movement to beat pet cancer by first, familiarizing yourself with the warning signs of pet cancer and sharing this knowledge with your friends and family, and joining us throughout the conference and beyond on the Puccini Foundation's Facebook page and on @puccinirules. 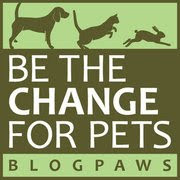 As always, thanks for your support and all you do to help companion animals. We're behind you all the way, Parental Unit! 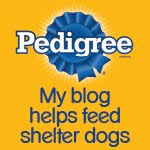 How awesome that you'll be representing the Puccini Foundation at BlogPaws. Have a great time -- wish we were going this year! We wish you were going, too! Have a pawesome time! Will miss seeing you! Guess who we met in person? Pip and Ruby's Parental Unit!